Interstate 759 branches east from I-59 across the city of Gadsden to U.S. 411 (Rainbow Drive) south of Downtown. The four lane freeway connects with Black Creek Parkway south to Rainbow City and crosses Lake Black Creek on a causeway linking with U.S. 411 and State Route 759 east. SR 759 extends from the east end of I-759 across the Coosa River to SR 291 (George Wallace Drive). Plans for potential extensions of Interstate 759 date back to 1985. Creating a bypass route for U.S. 431, proposals discussed taking I-759 westward to U.S. 431 in Attalla and northeastward to U.S. 278 & 431 on the east side of Gadsden. The route of SR 227 shown on the Gadsden inset is now a part of the 4.6-mile long SR 211. Midway across H. Neely Henry Lake along Interstate 759, one half mile from the six-ramp parclo interchange (Exits 4A/B) with U.S. 411 (Rainbow Drive). Photo taken 06/25/12. Exit 4A departs for U.S. 411 (Rainbow Drive) south to the Clubview Heights community in south Gadsden and Rainbow City. Photo taken 06/25/12. U.S. 411 parallels the Coosa River north from I-759 along Albert Rains Boulevard to U.S. 278 & 431 (Meighan Boulevard) at Downtown Gadsden. SR 759 continues the roadway east 0.87 miles to SR 291 (George Wallace Drive). Photo taken 06/25/12. Button copy signs posted one half mile out from Exit 4A to U.S. 411 south. Photo taken by Chris Patriarca (03/21/03). Road work signs were in place for the construction of the second Coosa River bridge along SR 759 east of U.S. 411. Photo taken by Chris Patriarca (03/21/03). State Route 759 was previously unmarked at the east end of Interstate 759. Photo taken by Chris Patriarca (03/21/03). Button copy signs along Interstate 759 east at Exit 4B were carbon copied in Spring 2003. Photo taken by Chris Patriarca (06/19/03). Alabama 759 stems south from an at-grade intersection with Alabama 291 (George Wallace Drive). The two lane roadway quickly expands into a four-lane freeway ahead of the Coosa River and ramps to U.S. 411 (Rainbow Drive). Photo taken 06/25/12. Exit 4B departs for U.S. 411 (Rainbow Drive) north by Gadsden Mall as Alabama 759 transitions to Interstate 759. Photo taken 06/25/12. An Interstate 759 shield was posted at the beginning of Alabama 759 west. Photo taken by Chris Patriarca (01/11/03). Alabama 759 expanded to four lanes at the parclo interchange joining I-759 with U.S. 411. Photo taken by Chris Patriarca (01/11/03). Former button copy overheads at Exit 4B (U.S. 411 south). U.S. 411 parallels Interstate 59 southwest to Leeds. Photo taken by Chris Patriarca (01/11/03). Button copy signs preceding the exchange joining U.S. 411 north with I-759 (Gadsden Spur) west and Alabama 759 east. Photo taken by Chris Patriarca (03/21/03). U.S. 411 (Rainbow Drive) north at the westbound entrance ramp for Interstate 759. Photo taken by Ed Wilson (02/02). U.S. 411 shifts onto Rainbow Drive through a commercial strip anchored by Gadsden Mall ahead of the westbound on-ramp for Interstate 759. Photo taken by Chris Patriarca (06/19/03). This button copy sign for I-759 south on U.S. 411 was replaced by June 2003. Photo taken by Chris Patriarca (03/21/03). Red Mountain appears on the horizon one mile ahead of the modified trumpet interchange joining Interstate 759 with I-59. Photo taken 06/25/12. Interstate 759 crosses a pair of flood relief bridges at Big Wills Creek one half mile east of I-59. Photo taken 06/25/12. Traffic shifts onto the ramps for Interstate 59 at the west end of the viaduct over Big Wills Creek and Brooke Avenue. A roadway stub appears for the unbuilt western extension of I-759 below the end sign. Photo taken 06/25/12. Traffic partitions for a left side entrance ramp to Interstate 59 south to Birmingham and an auxiliary lane along I-59 northbound ahead of U.S. 278/431 (5th Avenue) at Attalla. Photo taken 06/25/12. 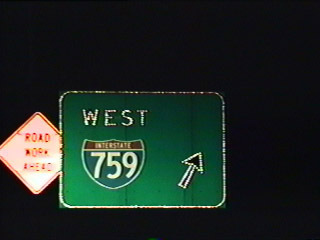 All button copy guide signs along Interstate 759 westbound were replaced in June 2003. Photo taken by Chris Patriarca (03/21/03). Westbound Interstate 759 at the ramps for I-59 and the roadway stub. Photo taken by Chris Patriarca (03/21/03). 1986 button copy signs at the ramp split for Interstate 59. Photo taken by Chris Patriarca (03/21/03). Interstate 59 straddles the southwestern slope of Lookout Mountain and proceeds across the city of Attalla to I-759. Photo taken 06/18/05. Interstate 59 enters a split-diamond interchange (Exit 183) with U.S. 278 & 431 (5th Avenue) on the one mile approach to Interstate 759 east. Photo taken 06/18/05. I-59 southbound spans Big Wills Creek ahead of the loop ramp (Exit 182) to Interstate 759 east. Alabama 77 follows in one mile as the last Etowah County exit. Photo taken 06/25/12. Interstate 59 travels seven miles northeast uninterrupted through Canoe Creek Valley. 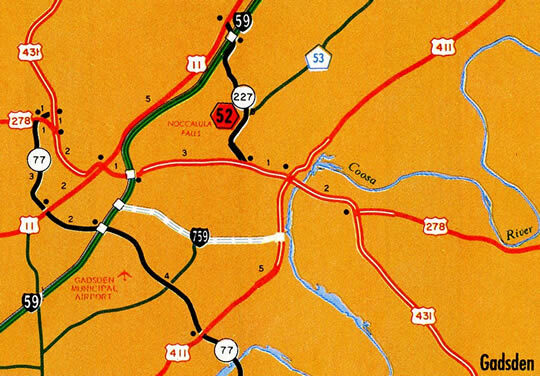 Succeeding interchanges connect the freeway with SR 77 to Attala and Rainbow City and I-759 (Gadsden Spur) east. Photo taken 06/25/12. The folded diamond interchange (Exit 181) with SR 77 is the first of three exits along I-59 north for Gadsden. SR 77 begins at U.S. 431 on the north side of Attalla and leads south to Rainbow City and Talladega. Photo taken 06/25/12. Entering the trumpet style interchange (Exit 182) with Interstate 759 east to Gadsden on I-59 north. ALDOT recorded 30,060 vehicles per day along this stretch of I-59 in 2010. Photo taken 06/25/12. “I-759 extension may have changes.” The Gadsden Times (AL), November 14, 2010. “I-759 back on drawing board.” The Gadsden Times (AL), June 12, 1993. “ALDOT official: I-759 extension needed.” The Gadsden Times (AL), November 16, 2015. “Interstate 759 extension through East Gadsden on ALDOT’s fast track.” The Gadsden Times (AL), April 3, 2017. “Rescinding the Notice of Intent for an Environmental Impact Statement; Gadsden, Etowah County, Alabama.” Federal Register, August 29, 2018. “I-759 opens Wednesday.” The Gadsden Times (AL), October 20, 1986. “I-759 bridge closer to completion.” The Gadsden Times (AL), January 25, 2004. Page updated May 15, 2017.